A conversation sometimes worth recording with mates Tommy Jackett & Josh Janssen. Each weekday, Tommy & Josh chat about life, creativity, business and relationships — big questions and banter. Regularly visited by guests and friends of the show! This is The Daily Talk Show. 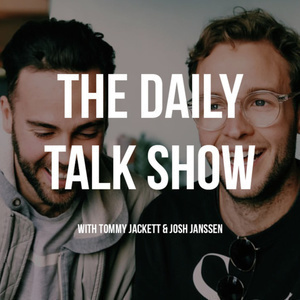 The Daily Talk Show — Friday March 2 (Ep 34) - Josh Janssen & Tommy Jackett. Another relaxing Friday night, this time, at Josh's place. Talking Hey Tiger, interacting with strangers, sleep, having a TV as a kid, auditioning for a reality show and more.